If you’re in the market for a new gaming computer and you want to go with a prebuilt system, in this guide, we’ve compared seven of the best prebuilt gaming PCs at various price-points to help you find the right option for your budget. In my opinion, you’re always going to get more bang for your buck if you build your own system. And, if you are willing to take on the task of building your own PC, I recommend checking out our affordable PC build guide, or our high-end PC build guide for recommendations on part lists at various budgets. However, if you’re not up for building your system and you just want to get a prebuilt gaming PC, in this guide, we’ve rated seven different options you have at a variety of price points. All of these options can be found on Amazon, but if you want a more customized system than the options listed below, check out our guide on the Best Custom PC Builders. As a quick-look view at four of our top picks for the best prebuilt gaming computers, we’ve made selections for the best extreme prebuilt system, the best high-end prebuilt computer, the best value option, and the best budget-friendly prebuilt gaming PC. *For more information on the computers above, click the “Read Review »” link and you will skip to our overview of that PC. To see our three Honorable Mention picks, keep scrolling down. If you have an extreme budget and you want to get a prebuilt gaming computer that can handle anything you throw at, you might want to check out CyberPowerPC’s Gamer Supreme desktop. It comes with a brand new RTX 2080 Ti 11GB graphics card as well as a brand new Intel Core i9-9900K eight-core processor. It also sports 16GB of DDR4 memory, a 512GB SSD, and a huge 2TB secondary hard drive. This Gamer Supreme package also comes with a 120mm AIO cooler, plenty of RGB lights, a keyboard, a mouse, and a mid-tower case that has a PSU shroud and a tempered glass side panel. In terms of performance, the RTX 2080 Ti and i9-9900K combination are good enough to jump into 4K gaming or to push games on a 1440P 144Hz+ gaming monitor. If you’re just looking to play games on a 1080P monitor, though, you could easily get away with spending a lot less as even the budget-friendly CyberPowerPC Gamer Xtreme listed below should be able to max out most games at 1080P resolution. Ultimately, though, the Gamer Supreme desktop from CyberPowerPC is one of only a few options out there that comes with both a new RTX 2080 Ti graphics card and a new Intel Core i9-9900K processor. If you want to build a gaming PC that will offer similar performance to this pre-built desktop, check out our $2,000 Gaming PC Build. For a more mobile option, check out our guide on the best RTX 2080 laptops. If you want to save a little bit of money and still be able to play games on a higher resolution monitor (like a 4K gaming monitor) or even on a 240Hz monitor, the Skytech Gaming Omega should also get the job done for you. The Omega comes with a ninth generation Intel Core i7-9700K processor, an RTX 2080 8GB graphics card, and 16GB of DDR4 memory. While the Omega doesn’t come with an extreme RTX 2080 Ti GPU like the CyberPowerPC Gamer Supreme listed above, the RTX 2080 that it does come with will still be powerful enough to game at 1440P or 4K with higher refresh rates. And, the Omega comes in at a significantly lower price than the Gamer Supreme. This system also comes with a single 500GB SSD (there’s no secondary hard drive) and a 120mm AIO cooler as well. Ultimately, if you’re looking for the best pre-built gaming desktop under $2,000, this is definitely an option you’ll want to consider. And, for a comparable PC build, check out our $1,750 PC build. To see our recommendations for similarly-priced gaming laptops, check out our guide on the best RTX 2070 laptops. For our top value option, we chose the iBUYPOWER Pro because of the hardware it comes with and the price it comes in at. For just under $1,500 you get a PC that has a new 9th Generation Intel Core i7-9700K processor and a new RTX 2070 8GB graphics card. That combination is good enough to be able to jump into 4K gaming. This system also comes with 16GB of DDR4 memory, a 240GB SSD, a secondary 1TB hard drive, and a mid tower tempered glass case that has a full-length PSU shroud in it. And, you get a 120mm AIO liquid cooler. The bundle also comes with a gaming keyboard and mouse combination. Ultimately, if you don’t quite want to pay a couple thousand dollars on a new prebuilt gaming computer, the iBUYPOWER Pro offers a nice balance between price and performance. This system will still be able to max out anything you throw at it with no problems. You can check out our $1,250 Gaming PC Build for a DIY option that will perform similarly. Or, if you’re considering a laptop as well, our guide on the best RTX 2060 laptops will help you find some similarly priced options. If you’re looking for an affordable prebuilt gaming PC, for just under $800 you can land the fairly powerful CyberPowerPC Gamer Xtreme. The Gamer Xtreme comes with an Intel Core i5-8400, an AMD RX 580 4GB graphics card, 8GB of DDR4 memory, and a 1TB hard drive. This system is by no means capable of running games at 4K or even 1440P, but for 1080P gaming, this system will be able to max out pretty much anything you throw at it. And, because it has an AMD graphics card in it, you can pair it with an affordable 144Hz monitor with FreeSync for an ultra smooth in-game experience. The system also comes with red LED lights, a keyboard and a mouse, and a case that has a transparent side panel and a PSU shroud. Overall, for the price that this system comes in at and the performance it is able to deliver, it offers a phenomenal value for gamers that are looking for a solid prebuilt desktop for 1080P gaming. If you’re willing to build your own system, you can check out our $600 gaming PC build for a similar performing DIY option. At just a little under $2,600, the Skytech Omega is a nice alternative to our extreme pick, the CyberPowerPC Gamer Supreme. Like the Gamer Supreme, Skytech’s Omega desktop comes with a newer RTX 2080 Ti graphics card. However, the Omega opts for an Intel Core i7-9700K instead of an Intel Core i9-9900K (which is found on the CyberPowerPC Gamer Supreme). Still, though, the i7-9700K is still plenty good enough to allow this system to run games at 1440P and 4K resolutions with no problem. And, just like with the CyberPowerPC Gamer Supreme, you’ll want to pair this system with a G-Sync monitor for an incredibly smooth in-game experience. In terms of storage, the Omega does come with the same size SSD (500GB) as the Gamer Supreme, but whereas the Gamer Supreme desktop comes with a 2TB secondary hard drive, the Omega doesn’t come with an additional hard drive. The bottom line is that, while the Skytech Omega will offer extreme performance, it doesn’t offer as good of value as the CyberPowerPC, which has a better processor and more storage, but costs the same amount of money. The MSI Trident X might be a better fit for you if you want to get a prebuilt small form-factor gaming PC. This mini gaming desktop comes with an Intel Core i9-9700K processor, an NVIDIA RTX 2070 graphics card, 16GB of DDR4 memory, and a 512GB SSD. So, despite its smaller size, it is still able to fit a powerful RTX 2070 inside of it. And, it also features a new 9th Generation Intel Core i7-9700K processor. The combination of the 9700K and the RTX 2070 will be good enough to max out any game on a 1080P monitor with ease and it should even be able to handle games on a 1440P or 4K monitor as well. The MSI Trident X does come in at ~$2,000, though, so in terms of price-to-performance, I’d recommend paying a little bit extra to get the Skytech Omega listed above, or save a little bit of money and get the iBUYPOWER Pro, as it comes in at a significant discount. However, if you like the smaller form factor that the MSI Trident X comes with, then this is one of the best mini prebuilt gaming PCs out there right now. Finally, we have the SkyTech Archangel. The SkyTech Archangel is a cheaper alternative to the CyberPowerPC Gamer Xtreme and so if you want to save a little bit of money, it would be worth considering. The Archangel comes with an AMD Ryzen 5 2600 processor, an AMD RX 580 4GB graphics card, 8GB of DDR4 memory, and a 500GB SSD. In terms of gaming performance, the combination of the Ryzen 5 2600 processor and the RX 580 GPU should be powerful enough to handle any game on a budget-friendly 1080P monitor. 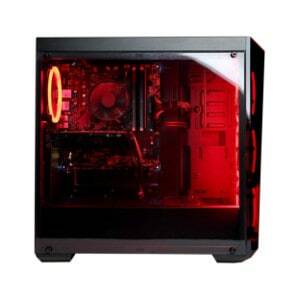 In fact, this system will perform on par with our Top Budget Pick, the CyberPowerPC Gamer Xtreme. Both systems also come with a gaming keyboard and mouse as well. Ultimately, either the SkyTech Archangle or the CyberPowerPC Gamer Xtreme are worthy options to consider if you’re looking for a cheap prebuilt desktop that can handle any game you throw at it. Prebuilt Gaming PC? Or, Build Your Own? There will always be a case to be made for choosing to build your own PC over buying one prebuilt. However, not everyone wants to go through the process of building their own computer. And, if you want a prebuilt gaming PC that can be shipped to you and up and running as quickly as possible, then a prebuilt desktop is probably the best option for you. In this guide, we’ve given you seven of the best prebuilt gaming desktops at various price points to choose between and, depending on your budget and needs, one of them should work for you. I recently found this site and I love it, great job and very informative. I have two quick questions for you. I really like the Skytech Beast option except for the part that I need 16GB of RAM to play some of the newer titles that I want. I am by no means a computer expert and in truth I am hesitant to try to build my own PC due to both my lack of time and experience. Thus, Could you recommend the additional 8GB RAM card (Link, for example) so that I can have everything on hand? It should be easy to install, right? Second, I see that the honorable mention, ZOTAC GAMING MEK1 is at 1200, perhaps I should go for that instead? A bonus question, if you allow me, should I wait until black friday/cyber monday? I’m planning to, to see if there are good deals, but 400 bucks for the MEK1 is nothing to scoff at. I’m interested in hearing your opinion, if you have the time.